How can investing in disaster risk reduction enhance resilience and achieve economic growth and sustainable development? The book "Disaster Risk Reduction for Economic Growth and Livelihood," which addresses this theme, was published by the British company Routledge on May 5, 2015. It summarizes worldwide experiences and research, including Japan's. JICA Vice-President Kae Yanagisawa was one of the editors of the book, and its authors include government officials, researchers and university professors of Japan, as well as JICA staff members. All of them are experts who have experience in projects and research on disaster risk reduction and recovery around the world. "Japan is prone to disasters including earthquakes and therefore it has a unique history of practicing disaster risk reduction beginning 1,200 years ago," Yanagisawa said. "There are many countries where efforts for disaster risk reduction are insufficient." The book shares the mindset of Japanese people, which is referred to as "the culture of prevention," and showcases various initiatives based on the lessons of disaster risk reduction and recovery. "In fact this book is intended to share not only Japan's and JICA's experiences, but also various international experiences in cooperation with international agencies and experts from other countries," Yanagisawa explained. In particular it examines recovery experiences in Aceh Province, Indonesia, after the 2004 Indian Ocean earthquake and tsunami; disaster risk reduction initiatives in Bangladeshi local communities; and measures to cope with drought in Africa. The authors come from a wide range of backgrounds. In addition to Japan, they are from the World Bank, the United Nations Development Programme, the European Commission's Humanitarian Aid and Civil Protection Department, Indonesia and Bangladesh. "It is no exaggeration to say that almost all the main actors engaged in disaster risk reduction in the world participated in the creation of this book," said a representative of JICA's Global Environment Department. The damage caused by recent disasters is frequently discussed in connection to climate change. But Yanagisawa said it is more complex than that. "For example, even if a flood is a once in 50 years event, all the damage could not be attributed to climate change," she said. "Another aspect includes urbanization without proper consideration of disaster risks. 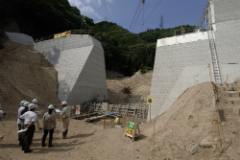 In Thailand, a disaster countermeasure master plan was created with the support of JICA in 1999, but because it was not implemented, the damage from the 2011 floods was magnified." 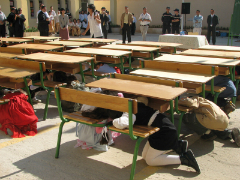 "Many countries place a low priority on investments in disaster risk reduction. 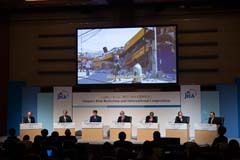 For this reason, JICA wanted to communicate that investing in preventive measures, including 'Build Back Better' in the course of disaster recovery, will contribute to sustained economic growth. Another message is the importance of mainstreaming disaster risk reduction ' in which disaster risk reduction is not done for its own sake, but rather it is incorporated into various sectors including infrastructure improvement and school building." The book is expected to be widely read and used by all experts engaged in disaster risk reduction in national governments, aid agencies, donors, community members and businesses. "The particular target of the book is government officials in developing countries," said Yanagisawa. The book's prefaces were written by Akihiko Tanaka, the president of JICA, and Margareta Wahlstrom, the United Nations Special Representative of the Secretary-General for Disaster Risk Reduction.